Breezeway helps you clean, inspect and maintain the properties you manage, so you can work efficiently, deliver better service and create happier clients. Real-time updates and task tracking. Check the progress of teams and workers in the field. 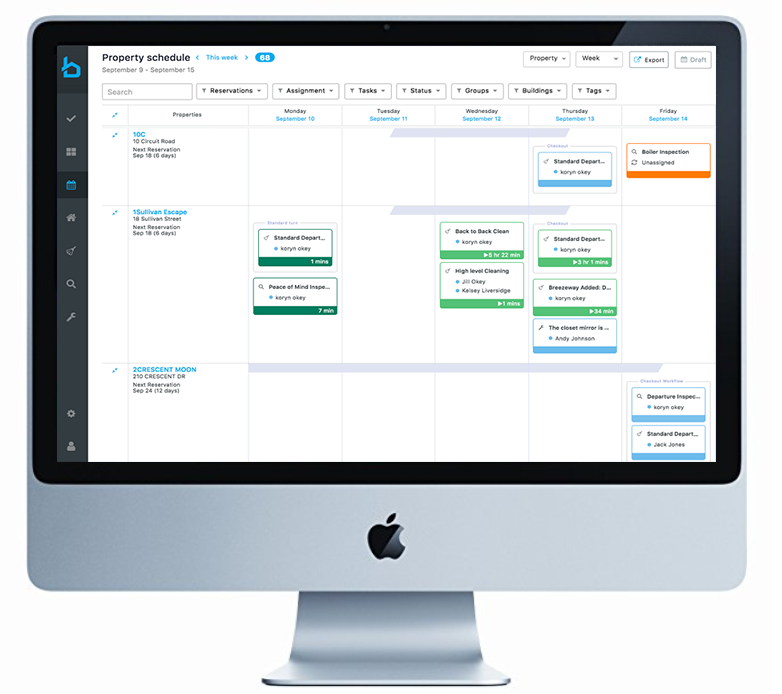 Powerful scheduling and automated workflows. Coordinate multiple teams with smart assignments, GPS and task-time forecasting. Seamless communication. Produce comprehensive reports that keep your team and owners informed, and showcase the quality and attention of your work. Friendly integrations. Leverage integrations with the industry’s best software, so you can harness the power of all your property data. Find out how Breezeway can help your operations! "I've been using Breezeway for about a year. I could not do my daily job without it. I find everything I need on Breezeway; cleanings, inspections, house readiness status, what has been paused and what work is currently being done at each property. Breezeway makes my job as Head of Housekeeping easy and efficient." Breezeway’s mobile solution provides field staff and contractors with the intelligent tools they need for quality property care, and enables managers to showcase the full value of services to owners. Property managers are in total control of turn days with real-time updates and powerful task scheduling based on property details and custom workflows -- so that managers feel confident that properties meet their brand standards and are guest-ready. Copyright 2019 Breezeway Homes, Inc.